I love to give simple gifts from the heart. 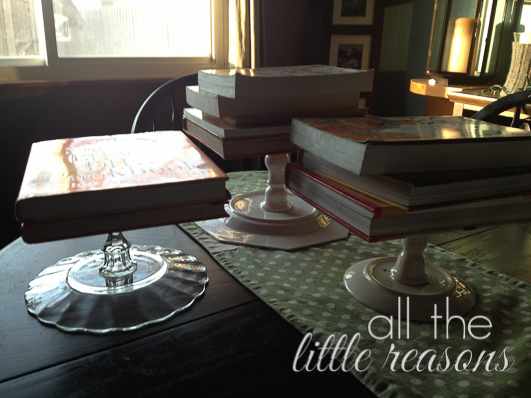 These pedestal plates have been all over Pinterest, but because you’re using something different every time, they look new and unique each time! They are so simple to make, but you just need to plan ahead because they take a little time to set up. 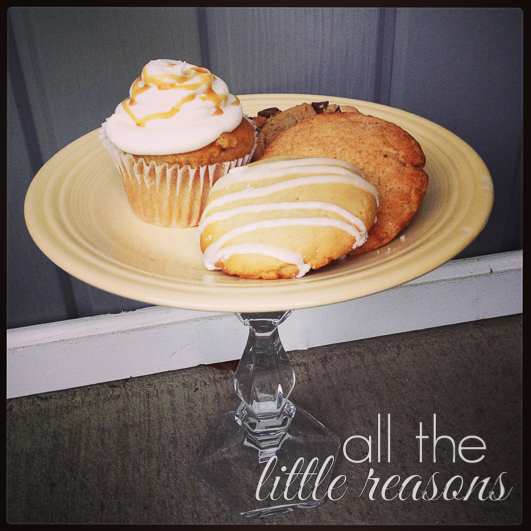 These three above were given as teacher gifts last year, topped with yummy pastries. This one below was dropped off to a friend on her birthday. Start by shopping for candle sticks and unique plates. I always check Salvation Army and Garage sales for candle sticks and oftentimes pick up clearance plates at Target. The process to make them is simple. I use a candle stick on bottom. 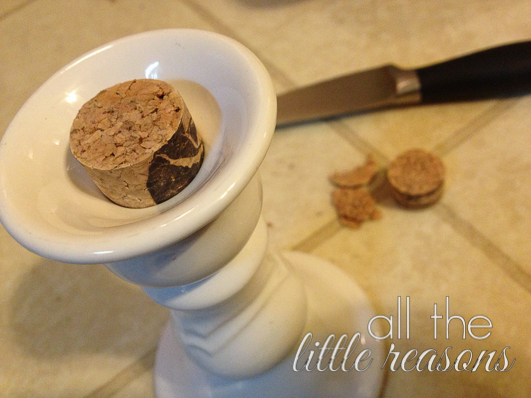 If it’s not a clear candle stick and plate, I fill the gap with a cork in order to make more surface area for the glue to adhere to. If it is clear, I just glue around the edges because it would be ugly with a cork in there. 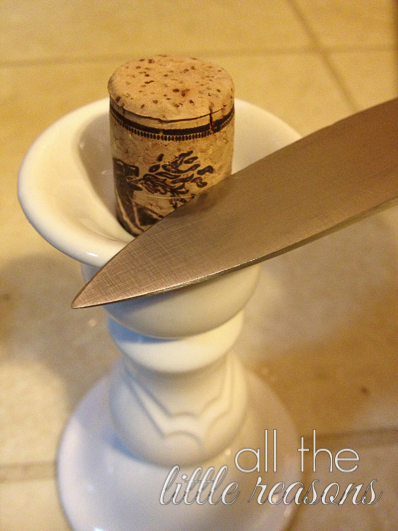 I pop the cork in as tightly as possible, and cut the top flush with the top of the candle stick. Pick up some of this E6000 epoxy glue. I got mine at Hobby Lobby but I’ve also seen it at Joann’s. It’s less than $5 with a coupon! Put the glue on and follow the instructions on the package. I think mine said to put the glue on both surfaces and wait one minute before joining them. But just do what yours says! Turn it upside down and put some heavy books on top. Do not move it for 24 hours. I usually let mine cure for about a week before I give it as a gift. They need to be handled with care, because unlike one that is molded as one piece, these plates can come apart at the joint. As a disclaimer, I did break 2 or 3 in the beginning. I think those ones mostly separated because I was not careful when I transported them. Also, I didn’t let them cure long enough before they were used. I wash and dry mine by hand because I don’t trust the dishwasher. I began making them a couple years ago and this one below was one of the first I made. I use it all the time and it has held up perfectly. It’s so simple and versatile. 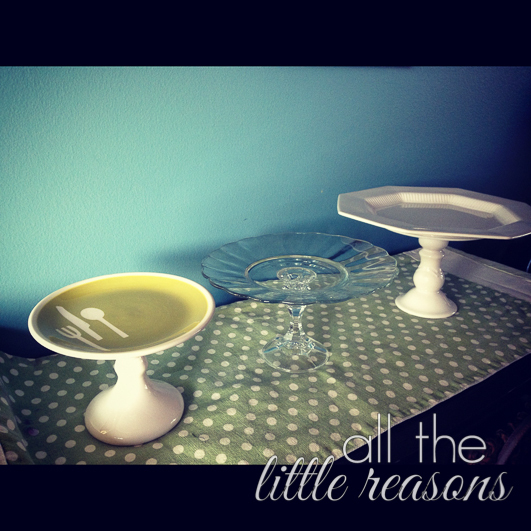 I hope you make some of these to give away as gifts, or to use for your next party! I made at least ten of them for the dessert buffet at my niece’s wedding. It was gorgeous to have all different sizes and heights. Try it out…the sky is the limit! Very cute! I’ll try these for Charity’s wedding! Thanks! I am sure it will be beautiful!